I spent the last week in Little Rock, Arkansas with most of my normal waking hours spent at the Public Service Commission hearing on the power line project proposed to go through my small local community. It seems that the power industry has enormous power, and since April, when AEP/SWEPCO announced their intention to force their way with an extra high voltage line through Eureka Springs all of us have felt like small furry critters with feet caught painfully in steel traps. Unfortunately the hearing is not complete. Due to a last minute motion that would allow the Utility giant to add testimony from the trial to its initial application, thus falsely maintaining that its application was complete, the judge simply recessed the hearing to be continued at a later date while attorneys file necessary briefs. Thankfully, our attorney is good at his work. He put each of their witnesses through a grueling round of testimony. We have ample material to force consideration of this case in appeal. My own particular concern has to do with whether or not the power company and the public service commission will be held accountable to state law. They cut and pasted their statement of economic impact from the application for an earlier project to the application for this one without ever performing the analysis of economic impact on the local communities that is required by law. Copying from one document to another is not in any way evidence of analysis. We learned that the power companies have been held to extremely low standards and this one was caught off guard when a group of citizens who've been not quite as complaisant and powerless as is the norm, rose up in vehement opposition. It has been a near perfect storm... A powerful company that has always been granted its way, facing a group of citizens who are so passionately loving and protecting of their homes and properties that they are willing to stand their ground. More people in Eureka Springs are taking the power line threat as their excuse to install solar. As I discussed with Save the Ozarks power transmission specialist Hyde Merrill, if you have solar power on your roof top, your home can serve as a battery by storing either cooling or heat, thus reducing demand at peak times on the power grid. The greatest demand that comes closest to overloading the grid is when people return home in the afternoon and turn down their air conditioners. Solar power can be fed into the home offset the power required to do specific things, like pre-cooling the home, or preheating hot water. That man is nuts. We've certainly said So far, with the grilling of our attorney it is much more apparent that their corporate malfeasance is being more fully revealed. I've been thinking of a couple books. One is "Shepherd of the Hills" which is about life in the Branson, Missouri area in the early days of pioneer settlement. A important quote from that book comes from Psalm 121:1 "I look to the hills from whence cometh my strength." Those of us here in Little Rock, (although I would rather be home in my wood shop) feel the strength of those who are at home holding thoughts for our success. This includes nearly the entire community of Eureka Springs, the hills we look to for support. The second book is one written by my old friend Donald Harington, "A Choiring of the Trees," which is about a man wrongly convicted of murder and held in prison on death row near Little Rock. From his cell, he could hear the songs of the trees sung from his home in Northwest Arkansas. He finally escaped from prison and made his way home to the forests he loved. I will be home by Friday night or Saturday morning. I spent most of this week visiting my sister in Phoenix who is in hospice care. It is very difficult to see someone who has been a part of your whole life passing through such circumstances. In the meantime, our hearing in Little Rock over the SWEPCO high voltage powerline expansion will begin on Monday, and I'm preparing myself as one of the witnesses against it. Please wish me luck. A week away from the wood shop just at the time when I should be preparing for classes at Clear Spring School will be a test for me. Woodworking is not only my passion, it is also my therapy, which grounds me in the moment and assists in framing my mental state. 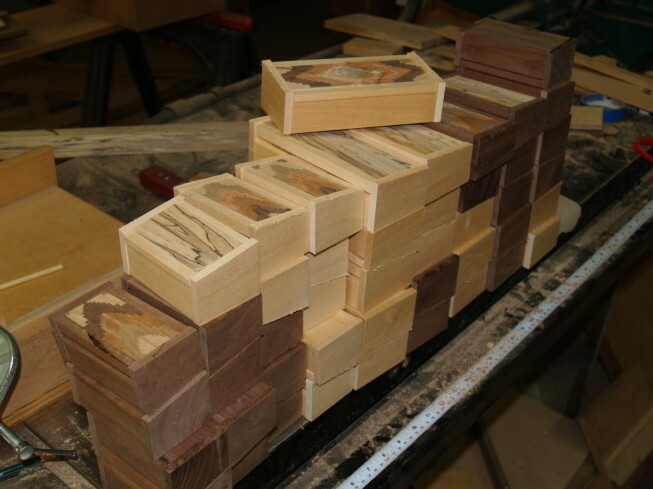 Some have called woodworking "sawdust therapy," and that's not far from the truth for many of us who participate in the woodworking art. There is a shift of mind and presence of being that happens when a person is engaged in creative work. Early manual arts advocates believed that common folk, and those of the upper classes, would each become morally bankrupt without the opportunity to be creatively engaged through the making of useful beauty with their own hands. More recently, Matti Bergström described a syndrome he called "finger blindness" concerning those who've become "values damaged" through lack of creative engagement of their hands. I ask my readers to look around and see if this is the world we would most like to have created for ourselves? If not, then the wisdom of the hands, and our own creative engagement in the service of others through the making of useful beauty offers some high ground. Seeing my sister in her current state was a clear reminder of my own mortality. We each are given our days to share what we can. I am lucky to have been given the opportunity to share the joy I find in my own creative work with others through my books, my work, my teaching, and with readers of this blog. 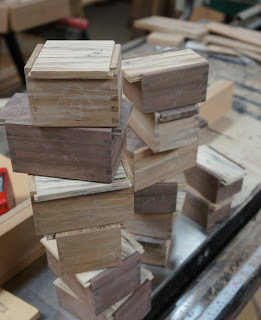 In the wood shop, I'm assembling parts of my box towers, as you can see in the photo above. Next, I'll make lids and bases, sand the outsides and install the rare earth magnets that will hold the components together. John Locke (1632-1704) following Comenius' lead and offering his "Thoughts on Education" recommended carpenter's, joiner's and turner's work as healthy and suitable work for university men and men of business: "For since the mind endures not to be constantly employed in the same thing or way (and) sedentary or studious me should have some exercise that at the same time might divert their minds, and employ their bodies." "We are thinking of having workshop days once a week and/or half or whole days scheduled regularly where the kids leave the four walls of their classroom, both to explore nature and urban space, but also to visit for example workshops, studios, ateliers. Do you have any recommendations or insights, either about how to create and maintain a network with local workers and artisans, and/or about how to schedule this kind of outward reaching teaching?" How often do the kids you work with go out and visit? How long do you take to prepare them for a visit and how long for them to process afterwards, both in terms of using what they have learned directly with their hands, and in terms of drawing that work into their english, or math, or other classes? Do your students write about these visits?" Our kids at Clear Spring School spend a great deal of time off campus making visits to various people and places in our community. Visits to the studios of craftsmen and artists are a part of that mix. Our students also visit organic farms, take walks to the public library, make use of local parks for their recreation and attend woodworking classes in our school wood shop. Our wood shop projects are designed to fit with what the students are studying in their classrooms. The idea is not just that students are exposed to craftsmanship, but also that what they make extends their hands-on engagement in their other studies. One simple example is making a hand carved pen prior to their learning to write cursive in real ink. By focusing our woodworking activities on making tools that further engage the students hands in learning, our intention is to deepen hands-on learning throughout the school campus. Yes, our students write about all their activities. But I am reluctant to require them to write about wood shop. I want them to know that the craftsmanship they express is evidence enough of learning without the requirement that they do something contrived and unnecessary and that burdens their enjoyment of the wood shop experience. Obviously, we use math in wood shop, too. We talk about fractions and angles when it is necessary to do so, and with that necessity being made known by the task at hand. Having our own wood shop is an important part of the Clear Spring School experience. It is wonderful for kids to become familiar with all crafts. It is also important for children to gain greater depth of experience in one craft because that allows them to gain a better perspective on how they learn over time. Things that were difficult become easy through practice. And the experience of learning can be directly applied to anything further that the child might ever want to learn. Becoming better at sawing, or nailing, or measuring, explains the life of the craftsman whatever the medium of choice might be at a later date. To have experience of growth in one material and with one set of tools can help a student gain insight into what all other craftsmen and artists do in the development of their work. One great thing is that a teacher doesn't have to be a great craftsman to start working with kids in wood. And the same teacher who teaches reading or math can with interest and practice become a good teacher of wood shop, provided the classes are small and some understanding of safety is attained. The following is from Danish Sloyd, published by the Danish Sloyd Association, in 1903. Ever since the train of ideas of the Middle Ages was discarded by the spirit of modern times the aim of education has been to get more and more into a close relation to reality. Life, not learning, has become the end of education. A one-sided theoretic action on the mind of the child has been replaced, step-by-step, by a more general development of human nature. 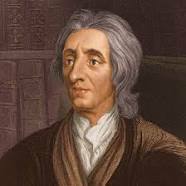 For the last three hundred years there has scarcely been any prominent spokesman for pedagogical interest who has no insisted upon the importance of the training of the body besides that of the mind and upon the value of practice as the base of theory. Already Amos Comenius (1592-1671), in his plan of a school for the children of the people, says that, the pupils ought to become acquainted with all the more important trades, that they may not be too ignorant of what takes pace in life, and also that it may become easier to decide in what direction each individual is principally drawn by his natural propensities. "One of the challenges we are facing is how to incorporate more fingerwork in the curriculum. We are thinking of approaching local workmen, craftsmen and artisans (men and women, of course), and perhaps also some who are retired, and asking them to help teach, either by allowing our kids to come visit them, or by coming to our classrooms to demonstrate, teach and work with the kids." I think you will find a similarity between what early Danish Sloyd practitioners believed and what Karen and her associates are planning for their own children. You can see that I'm making slow progress despite distractions from AEP/SWEPCO's rude intrusion into my life. 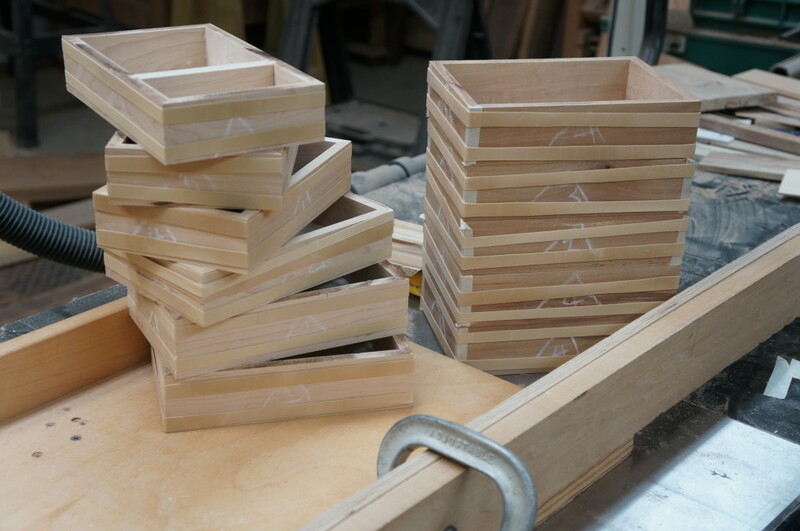 The stackable boxes now have dividers that will house the rare earth magnets that will hold the trays together and allow them to be stacked straight or pivoted into other balanced, unbalanced, symmetrical and asymmetrical arrangements. I got an email from an American blog reader in Denmark who is starting a school based in part on "finger wisdom." She posed a long list of questions which I will try to address in the blog as a point of discussion over the coming week. It is interesting to me that most of the same questions we ask now were asked before in the early days of manual arts training. Denmark was one of the places that was very much involved in Sloyd training, and long after Educational Sloyd was forgotten in America. What a wonderful thing it would be for modern children to become involved with craftsmen who had that particular training of hand and mind. I look forward to hearing more. Today I'm continuing work on my boxes that are held together by rare earth magnets and that can be arranged to symmetrical and asymmetrical configurations. I've also been attending to various SWEPCO related tasks having to do with stopping the powerline and the hearing coming up on the 26th. I was quoted today in an article published in Arkansas Business Magazine called "Powerline In Ozarks Prompts Firestorm," which is an apt description of the chain of events. 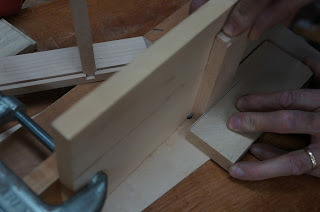 In the photo above you can see the simple router table process for routing the dovetailed dividers that will also form the pivot points connecting the various components of the box. Today I am working on boxes that explore symmetry, balance, and imbalance related to 3-D design. These shallow boxes will be held together with rare earth magnets, and can be arranged by the user into various configurations. It seems that some folks are disturbed by imbalance, some are bothered by asymmetry. My own feeling is that good design uses these principles to create visual tension in a piece. To insist that objects be balanced and symmetrical is like saying one should never eat broccoli. One of these boxes will be held together by magnets in such a way that they simply stack and are held in relation to each other. That may be just what some folks are looking for. The other two will be subject to "arrangement." Which is more fun? Asymmetry and imbalance make you feel uncomfortable? Even the boxes subject to arrangement can be arranged to express symmetry. 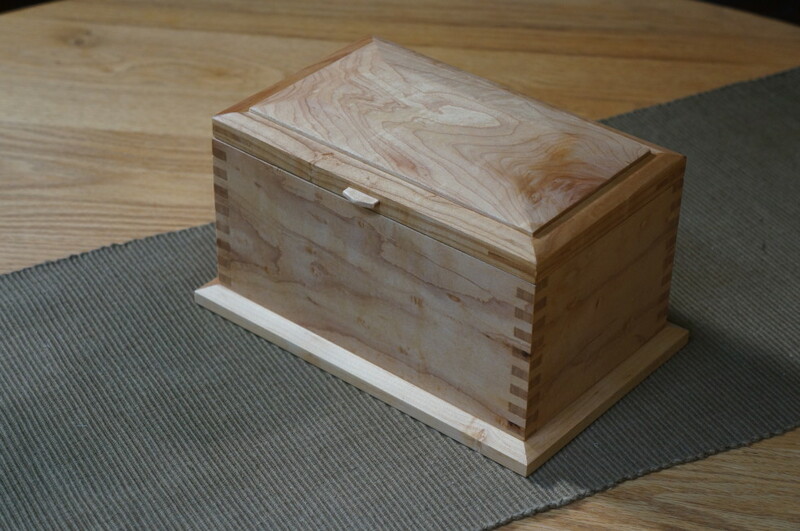 True to the principles of Educational Sloyd, these boxes can be made by simply adding a few more simple steps to those learned earlier in the book. "The passive ability to receive images of sensory things, said Descartes, would be useless if there did not exist in the mind a further and higher active faculty capable of shaping these images and of correcting the errors that derive from sensory experience. A century later, Leibniz spoke of two levels of clear cognition. Reasoning was cognition of the higher degree; it was distinct, that is, it could analyze things into their components. Sensory experience, on the other hand, was cognition of the lower order; it ask could be clear but was confused, in the original Latin sense of the term; that is, all elements fused and mingled together in an indivisible whole. 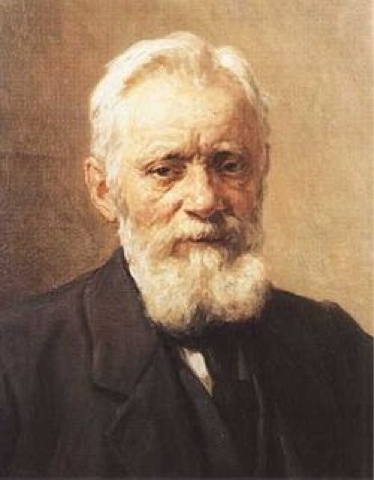 Thus artists, who rely on this inferior faculty, are good judges of works of art but when asked what is wrong with a particular piece that displeases them can only reply that it lacks 'nescio quid,' a certain 'I don't know what.'" I am sorry to have to inform my readers that Descartes and Liebniz are full of nescio quid. In learning, it is not the checking of sensory experience against a set of contrived intellectual structures, "reasoning" that is required but that what we are told or have assumed and "reasoned" be checked against what we can actually experience for ourselves from real life... From reality. So most of education is backward. And in response to Arnheim, I would say that visual thinking is not enough. Thinking must become tactile as well. It must take place in the hands as well as in the mind. While the eyes can gain their perceptions from far beyond arms length, those perceptions are made more real to the learner when the distance is cut to allow hands-on full engagement with the subject at hand. The point having to do with nescio quid, is that just because a thing cannot be adequately explained in language does not make it any less real. We have no way of understanding "animal instinct" for example. How does it arise? Is it encoded in DNA? Or do the patterns that drive the mating rituals of various animals arise from training of some kind? And just because we can't explain or understand using our capacity for languages, doesn't make animal behaviors any less real. But making a fool of ourselves over what we may say is never more than an arm's length away. Today is a big day. I'll be working in the shop. In Little Rock the pre-hearing with attorneys will be held concerning AEP/SWEPCO's attempt to blast and bulldoze their way through the Ozarks. Our attorney will offer a motion for summary judgement and dismissal asking that the whole project be cut from the APSC docket due to the inept and illegal manner in which the project and application have been handled. Wish us luck. In Descartes' world, and the world of education that came as a result, what you see in your mind trumps what you see on the ground. In the perfect world of engineering on paper and planning from the vantage point of google earth in which you are looking at earthly reality from space, the AEP/SWEPCO powerline might seem like a good idea... good for profits, anyway. But when folks live in the path of powerlines, and know the value of their own homes, and have hands on experience in caring for the land, what you see from Google Earth is not a clear enough basis for damaging people's lives. "The Waste Land, let us say then, is any world in which (to state the problem pedagogically) force and not love, indoctrination, not education, authority, not experience, prevail in the ordering of lives, and where the myths and rites enforced and received are consequently unrelated to the actual inward realizations, needs, and potentialities of those upon whom they are impressed." "What is lacking in the Waste Land is authenticity. Truth is not the product of experience. There is a split between the spirit and nature so there is no vitality or generative power. The proper response to the Waste Land situation is to heal the split by following one’s own nature". The prescription is for more time in the wood shop. This morning, an article told about AEP/SWEPCO's condemnation by eminent domain of an animal park offering sanctuary to wild things. It is what we've come to expect from large corporations, who have their eyes on profits and have no sense of community or compassion for common folks. I placed a call to the President and CEO of American Electric Power to protest the foolishness and destructive activities of their SWEPCO subsidiary. They should literally be ashamed of themselves. Sanctuary and wasteland are two distinctly different places, and most folks when they stumble upon Eureka Springs, for what ever reason, have a very clear understanding of the difference. Tourists come here just to absorb the vibes of the place, but executives of powerful corporations seem to have little understanding of real values. Today we had the annual Rotary Teacher Luncheon in which all the teachers gather to be honored by members of the local chapter of Rotary International. And now, as an exercise in healing my own spirit, I get to play in my own sanctuary. The wood shop. Psychologists, in hoping to come to an understanding of human development have described it as taking place in stages. For example Jerome Bruner had noted that the child first engages the world through action, then through imagery, and finally through language. That view is short-sighted in that it fails to recognize that all three means retain their significance in human understanding. We don't grow from one level to another as an exercise in mutual exclusivity. We never outgrow the need to engage the world through action. We never outgrow the necessity to test what we've learned from the world through what we do to it. And that too is a process of thought, the meaning of which seems to to have been lost among those too-long sequestered within the self-congratulatory framework of intellectualism. Descartes may have said, "I think, therefore I am," but when he woke up with that notion the was forgetting the woman who served him breakfast, and he was forgetting breakfast itself. When Educational Sloyd principles required that students move from the known to the unknown the idea was not that they stay there without connection to the previously known. The principles of moving from the simple to the complex or from the concrete to the abstract did not mean that once moved from simplicity and concrete experience, that the student would be best served by hanging out in that virtually empty space, but instead must build a coherent framework of useful knowledge. When we are actively engaged in thinking with our whole bodies through the making of beautiful and useful things, we are involved in learning and thought that transcends the limited capacity of language, and yet, in schools, it is thought that language and facility in language is the almighty all. Learning that is not active is little more than a game of trivial pursuit with diplomas. I am in the process of getting chapters 5 and 6 of my current book off to the publisher, taking a few beauty shots for earlier chapters and will be spending some time on chapter 7. It is fun to visualize new designs and my head was full of those designs as I faded in and out of sleep. Last night I went to see US Congressman Steve Womack in a public meeting. He's voted about 40 times against "Obamacare", but only promised to ask SWEPCO some more questions about the powerline project that the utility company intends to force through our local community. In Q and A, as I challenged him with my own questions, he asked, "Speaking hypothetically, if I, as a private citizen, not as a member of the house of representatives, were to write a letter to SWEPCO asking that they halt the project, do you think that would do ANY good?" I answered, "At least we would know whose side you're on. 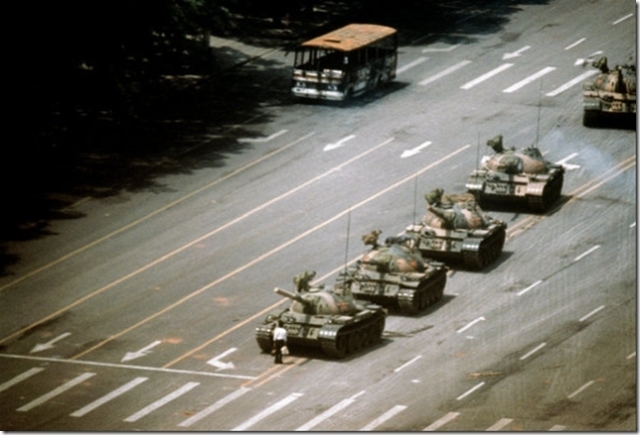 We might take some comfort knowing that in the struggle to protect the sanctity of our homes we were not standing alone." I am absolutely sick and tired of corporations and politicians and how closely they are aligned. I've come to the conclusion that corporations are not real people. Those politicians closely aligned with corporations as it appears Womack may be, suffer from the same loss of humanity. Once they get so high and mighty and full of themselves from feeding at the corporate trough, they are of no use to the rest of us. From my books surcease of sorrow." If Poe had sought to find himself in concrete creative acts, he might have found what his books could not provide. This morning I got up early and began working my way through two chapters of my new book, attending to chapter text, captions, and slides, making certain that each works o make the point and that the text, captions and photos are integrated into a form that my editors can comprehend. Next comes the cutting list. I'll go over my sketchup drawings of the two projects and create the list by double checking the dimensions I've put into the drawings, and then again double check from the actual boxes I've made. It can be mind numbing work. I try to do it when my mind is fresh, and it requires breaks of physical activity to keep on track. If I force myself to work at it too long, my brain is fried. "Work is less boring than amusing oneself. "[Baudelaire, "Mon Coeur mis a nu," 1862] And I'll add that physical work is less taxing than work of the mind alone. This morning I have to get an order off to the Historic Arkansas Museum and put the final coat of finish on the Arkansas Governor's Award for Quality. I need these physical diversions to keep fresh for the rest of it. After a time at the computer my brain seems to no longer function properly. It's exactly how I remember it feeling to be in school. Can educators not understand that? In the design of modern education we should be focused on physical, productive and creative activity first and allow the mental activity to be stimulated by the child's growing curiosity. By doing real stuff, we have anchors to which what we learn becomes usefully attached. Everything is just trivia until we have a use for it. Between activism to prevent the unnecessary power line expansion into Eureka Springs, and attempting to get two chapters off to the editors for the new box making book, my brain is fried. In these cases, it is good to have some mindless tasks to tackle that leave some semblance of self-esteem intact. That means applying Danish oil to boxes, sweeping up in the wood shop, and driving the tractor up and down the hill, trying to repair damage from recent torrential rain. Tractor time is always soothing for me. It seems that when you are told something by an American corporation, like AEP/SWEPCO, you'd best not believe what they say. AEP/SWEPCO claims that they notified Missouri landowners that they are on one of the proposed routes for their 345 kV powerline expansion, but I've found a whole group of them who are spitting mad, just as we've been over the prospect of the beauty and value of our homes being destroyed in the name of corporate greed. These folks did not receive the certified letters that AEP/SWEPCO claims were sent. This situation doesn't necessarily mean anything in this case, because AEP/SWEPCO is not required by the APSC to notify Missouri residents. But it calls attention to an environmental impact statement and application process that has been completely bollixed from day one, that should serve as an embarrassment (if corporations could feel such things) and should serve corporate American as a glaring example of what not to do next if you have any sense of integrity. One thing I've discovered about myself that gets me in trouble. I have a strong sense of social justice. I don't like being jerked around, and I don't like seeing others jerked around either. This summer has been the rainiest on record for Northwest Arkansas, and it seems to just go on and on with more rain coming today. I've lived here 38 years and never seen such rain. In my own life, between getting ready for school to start, working on boxes to fill orders, working on boxes for the book, taking photos and writing, I'm up to my ears. Add the AEP/SWEPCO debacle to all this and you can see that I have my hands full. Yesterday, the attorneys for SWEPCO pulled three routes from consideration. That comes as no surprise since the US Army Corp of Engineers had recently informed them that these three routes would not be approved by them under any reasonable circumstances. One thing about corporations is that unlike real people corporations have no sense of shame. And the folks who work for them can be paid enough that they will have no sense of shame either. They can surround themselves with predators of their own kind and believe its the rest of us who are lacking. I was interviewed by Arkansas Business yesterday for an article that will come out a week from Monday. It is gratifying to see that the statewide press is finally becoming interested in our case. And that has only happened because the work to save our properties has been just as relentless as their efforts to take them from us. One of the AEP/SWEPCO routes removed from consideration is the powerline that would cut through our property. I was asked by the press if we feel relieved. At this point, I am so furious with the injustice of a corporation being able to violate State Law, and force its way through the homes and properties of my friends, and innocent landowners that I feel ready to take matters all the way to the Arkansas Supreme Court. 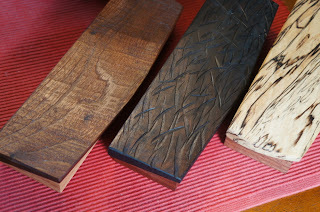 As I explained the reporter from Arkansas Business, I am a woodworker. I understand what it is like to make mistakes. I make mistakes of some kind every day. I own up to them. I fix them. I forgive myself, and when necessary I ask the forgiveness of others. If AEP/SWEPCO were a person and not a corporation, they would come to an understanding of the hurt they are inflicting on this small community. They would be offering their apologies and seeking our forgiveness. Instead, they are pushing through with things and we will be there for their days in court. If corporations could be embarrassed by their handling of this they would be. Again, I am thankful for woodworking. I can invest time in handling materials and feel connected with deeper things. In the legal struggle against SWEPCO, it is amazing the depth that witnesses will go to make their points, even when it comes to deliberate deception. A SWEPCO engineer offered a photographic exhibit attempting to show that even the Buffalo National River has powerlines crossing it. From Google earth you can see the power lines as shown in the photo which he submitted as evidence. But you can also zoom in and see that the pole structures and size of the line are a completly different type and size than that proposed to cross our lands. Can it be that an engineer cannot understand the difference between a power pole that is made of wood and is 60 feet in height and one that is 150 feet tall with a concrete foundation bored 30-40 feet into karst terrane? I've heard that many engineers don't know how to operate a tape measure. But if you can't gauge the proper scale of small things, how can you put larger things into proper perspective? Is there a point in one's learning that a sense of scale and proportion is no longer necessary to them? This week we learned of the death of a young friend who took his own life with one of his father's handguns. The note he left said that no one was to blame. I will not point fingers in any one direction. We do live in a society that is haunted by guns. The illness passes through generations. Fascination with guns is a disease that some of my readers would prefer I not talk about. The claim by some is that guns are just another tool. But not all tools have the same purpose. You don't cut wood with a hammer. And there is a difference between guns which are intended to take life, and the tools that are designed to affirm it. In a culture in which all children and adults found creative redemption in working with hand tools, we would have less depression, less despair, more purposeful lives, in which each found greater meaning and reward. And in that culture, bodies would not be discovered by little sisters, and mothers and fathers would not morn or wonder what they might have done differently to save the life of their child. It seems like so much resides in the scale and proportion of things. When we work at the smallest possible scale of things, doing our best work, giving it our best shot, we have a greater understanding of large things as well. 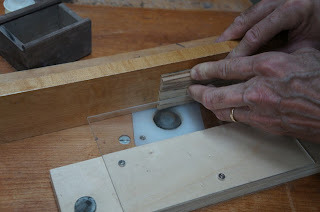 Salomon had said that if a person could understand the amount of work it took to make a parcel pin, he would have greater appreciation for the amount of work it took to make a table and for the person who made it. If AEP-SWEPCO engineers had more time invested in making small things as simple as a wooden box, they might also have greater understanding of the implications involved in foisting larger things upon us. And a young man who became infected with his own creative spirit, might be led toward greater sense of self and away from taking his own life. 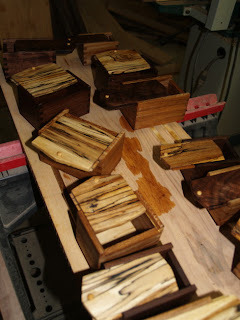 In the photo above you can see boxes being oiled. I've been sanding them, and applying Danish oil finish. One more coat tomorrow and the installation of linings and they'll be ready for sale. A reader, in response to my post on Ockham's (also Occams) Razor, tweeted that it's the sharpest tool in the woodworker's tool kit. Good point. In fact, a very sharp point indeed. There is a relationship between Ockham's razor, parsimony, and simplicity, that is particularly relevant to both craftsmanship and modern education. How do we keep things simple? How do we learn to perceive the essence of a thing when it is obscured by complexity? Imagine the rushing river of technology we all face! Kids these days may have sophisticated technological devices before they can think and be competent in (after all, the device is intended to require no skill or developed expertise) their use long before (if ever) they are trusted to handle a knife. In educational Sloyd, they regarded decoration of form as being a means of distraction from learning to achieve the essential beauty of form. You can hide poorly fitting joints by putting carving on a piece. Woodturners are much more likely to discuss form, because in a turned object, form stands out. But when objects are comprised of a variety of parts, each with its own form, achieving beauty of form becomes a more complex issue. So it is good to keep withdrawing one's attention from complexity toward the simple, whether you are crafting a large piece of furniture, or turning a simple form on the lathe. So it is, too with ideas. The human inclination seems to be the overcomplication of things. The purposeful withdrawal into simplicity pays dividends both in the world of form and in the world of abstract notions. In simplicity we may find truth. But modern education tends to be all in the wrong direction. Educators created elaborate structures for measuring the student's growth, and making the teachers and schools more accountable for learning, but in that layer of complication, the simplicity of the child's most normal and natural inclinations to learn are lost in abstraction. The child cannot even relate to his own learning. For anyone interested in the ways complexity can cloud truth, read through volumes of testimony, rebuttal, surrebuttal, all posted on the APSC website under docket 13-041-U. Yesterday was a big day in the case, and you can read my own surrebuttal here. In the wood shop, I'm doing the inlay on the bases for the Arkansas Governor's Quality Awards to be presented in September. I'm doing two in order to simplify and not need to take time to make another next year. I am also ready for the finish sanding of boxes. To witness progress observe the photos above and the same boxes shown below. Unfortunately, modern education only considers progress in learning when expressed and made complex through artificial means... either written or in the form of tests... both of which are artificial constructs and a step away from the simplicity of effort and real work.Its why so many kids can hardly wait to get out of school and engaged in the real world. The three things that are really required for the building of successful communities are skill, care and surrender. Without care being present, skill will never arise. I was thinking of this last night when I woke up early to go over my edited surrebuttal with our lawyer handling our case against the huge powerline planned by AEP-SWEPCO to traverse or forested lands in the Eureka Springs area. My surrebuttal is based on the failure of the applicant AEP-SWEPCO's to address potential adverse economic impact to our tourist economy. Folks come here in droves to see this place that is so beautiful, and it is beautiful still because folks care about the place. One of the difficulties of this statement of Arkansas law is that the word community may be interpreted 6 different ways. However, the word local brings it into perspective. If a person has not had the experience of living in a local community with its own set of particular values as to what folks care most specifically for within the confines of a particular place, they may not be able to understand the implications of what they might propose on those folks comprising a "local community"
In any case, my surrebuttal is finished and will be submitted as is required by noon today. Coming into contact with a company like AEP-SWEPCO and its witnesses and engineers has brought the subject of and the value of local community under a bright lens. Too many folks have become out of touch. They don't know what being involved in local community can bring. Being involved in a local community can lead one to want to share something with others in it. First you have testimony, then you have rebuttal, then you have surrebuttal, then sur-surrebuttal. Just in case you're as confused as I am, I'll tell you that when it comes to matters of the law, it often gets worse before better. This morning I got up early to craft my surrebuttal testimony for the case involving the power company AEP-SWEPCO in its application to cut an extra high voltage powerline through my local community. It seems that Arkansas State Law is carefully crafted and as is usually the case, words have been selected for their specific meanings. There's the rub. Neither AEP-SWEPCO in their application, nor the APSC in their review of it, have considered the economic impact of the project on the local communities through which the powerline will pass. No mitigation is offered to compensate communities for disastrous effects. Thankfully, getting up early has other rewards. I get to make boxes. Those in the photo above are ready for sanding. In a way, craftsmanship is like law. You go at it. Then you go at it again. By the time you get good at it, you're way past rebuttal, surrebuttal and sur-surrebuttal. Craftsmanship is better than law in that the case is never closed. You get to keep on making beautiful and useful things. As you can see in the photo I've been making more sliding top boxes. 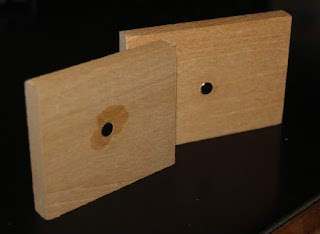 I realized that the mitered box joint was one that is too difficult to explain to beginning woodworkers. That joint will be offered as an option, but it is not the best starting point. By removing the mitered corners I've made the project easier for my readers to find success. That kind of decision is not always easy, but I know when I get to the writing of the chapter and the selection of photos for the book, that if I have to work hard at explaining, many of my readers will have to work even harder to visualize and understand. While some of my readers are ready for more complex materials, most of my readers are not. 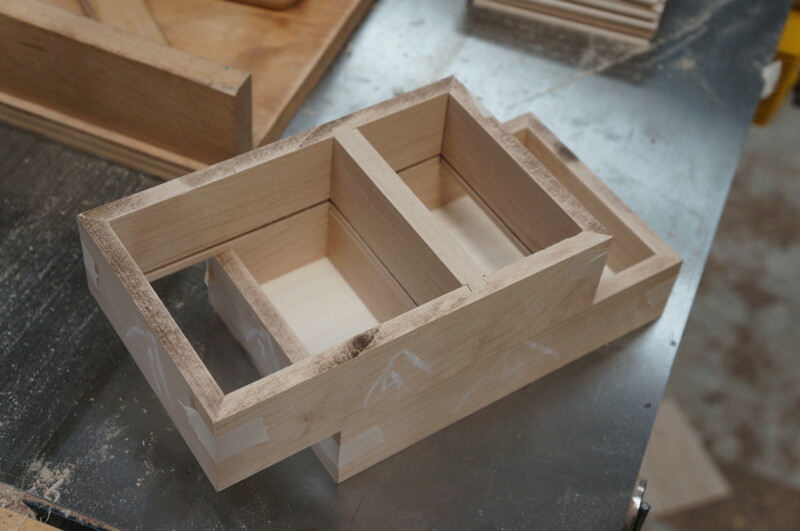 But in the name of parsimony, boxes need not be overly complex to be well crafted, beautiful and lasting. I made a new safety device to use when routing the edges of the lids. It allows me to see what I'm doing, but most importantly, allows the camera to see an edge being formed safely with a guard in place. 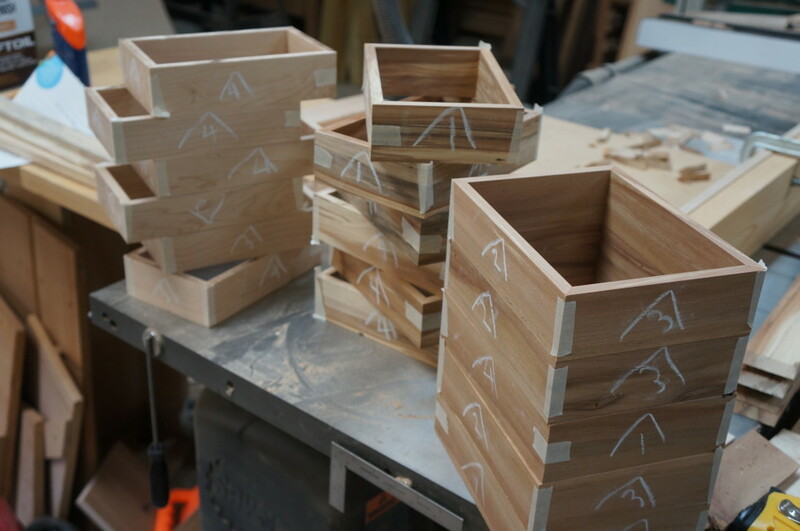 In addition to making these boxes and taking photos of the process through which they're made, I now have many of my production boxes ready for their hinge slots to be cut. After that, I can assemble the parts into finished boxes. In our race to get testimonies filed with the Arkansas Public Service Commission, Wednesday August 7 is the day surrebuttals must be filed as written testimony. All across our area, folks like me are just wishing AEP-SWEPCO would just pull the plug on their project and give us our lives back. Because they are a corporation and unable to sense the humanity of their chosen adversary, they are unlikely to withdraw and leave us in peace. Because we are human beings and this is our home that they threaten, we will fight on and on to protect it. Last night I tossed and turned in my sleep as I observed the movement and interrelationship of complex notions I could not grasp. I can't even tell you what they were or what they concerned, except that they were between possible truth and probable fiction. I bathed them in light. At some point things will become clear. In educational Sloyd, it was proposed that learning move incrementally from the simple to the complex, and from the concrete to the abstract. The law of Parsimony demands that we examine things in the other direction. Just as our intellectual understanding of the universe may be built layer by layer our deliberations must be aimed toward the center of things peeling away toward center. Simplify. And when done, simplify again. When when processes and concepts are kept simple,we reduce the opportunity for error and deception. The Arkansas Public Service Commission stopped an energy company "Clean Line" from doing business in the state. Clean Line had planned to build a massive 745 kV DC line to carry wind generated power from Oklahoma and Kansas to the Tennessee Valley Authority where it can be sold and distributed at a premium price because it is "renewable" energy. Their purpose was clear. Now, AEP-SWEPCO plans an extra high voltage powerline through Northwest Arkansas, threatening the beauty of our forests, and the quality of our streams and rivers. Their claim from the outset was that we need the new line for "reliability." Power company Entergy plans additional powerlines that carry on from my lovely county east toward Tennessee and the TVA. Are you beginning to get the real picture? On the one hand, the APSC refuses the Clean Line traversing the state, and on the other, is asked to consider new powerlines headed in that same same direction and of a scale completely unrelated to our needs. One side is truth, the other fiction, and when it comes to political alignments, the poor folks nested on beautiful hillsides could be sacrificed and run over by 150 foot towers marching through the woods throughout the state. 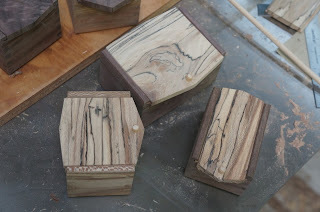 Today in the wood shop, I'll be working on boxes. The first time I do something, I may not understand it in the simplest of terms. The first time I'm confronted with what folks tell me, I may not be able to understand what they say in the simplest of terms. Craftsmanship entails the learning to not waste effort. It can take years in the making. It is amazing how much intellectual effort can be required in reducing things to their simplest terms. The photo above shows an experiment for my next box design. You will note that the rare earth magnet in one piece is set below the surface of the stock and the other slightly raised, so that when put together they align precisely. The new design will be a tower of nested boxes, each simply made and held together by magnets. There will be a secret compartment hidden in the base, also held in place by magnets. Normally summers in the Ozarks are hot, dry and humid, with high temperatures over 100 degrees F. and drought lasting from late June into September. This summer has been different. We've had rain and more rain. And today we're having still more rain. Where was this rain last year when we needed it most? I woke up in the middle of the night thinking about my next box project, and could not turn my mind off. By the time I was done thinking, I'd designed more than a few boxes in my mind, and came up with a new method for securing corners. I have two more chapter projects to do for the new book, and have come to the understanding that simple projects will be best. It is enough to illustrate the principles and elements of design without making the book a compendium of complex joinery and difficult to explain techniques demanding too many photos and pages. I start each book with an allowance, knowing that only a certain number of photos will fit, so I have to be careful and not use too many photos and pages on a single project. 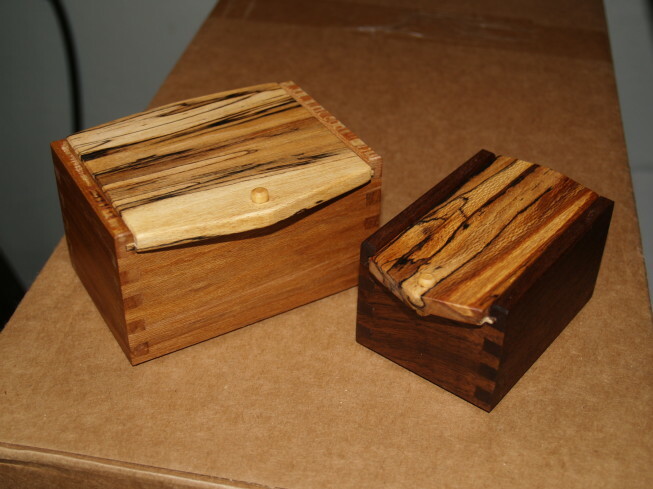 I was surprised that when I did my box making presentation at the Technology teachers meeting in Springfield, that they were asking for plans for making some of the designs for students to make. That was a good reminder that some of the things I take for granted because I do them all the time, may be completely new to others and interesting even though they don't express the highest level of craftsmanship. As folks (even teachers) have less experience these days in making things, the need to find suitable points of introduction to the craft of woodworking suggests that I keep things fun, interesting and relatively simple. My friend Jerry had accused me of being parsimonious, which I had thought of as a bad thing, until he explained that I've managed to eliminate steps, reducing their number and refining processes toward greater simplicity. 1. Unusual or excessive frugality; extreme economy or stinginess. 2. Adoption of the simplest assumption in the formulation of a theory or in the interpretation of data, especially in accordance with the rule of Ockham's razor. The law of parsimony or Ockham's razor, named after a 14th century mathematician, "is a principle of parsimony, economy, or succinctness used in logic and problem-solving. It states that among competing hypotheses, the hypothesis with the fewest assumptions should be selected. In other words, the simplest explanation is usually the correct one." In my work, the simplest method is often the correct one and easiest for my readers to follow toward their own success. In the wood shop, I can hardly wait to get back to making boxes. I'm ready to begin assembling the parts I've been working on for a couple days, and starting the 7th chapter book project. The word "foist" has been on my mind lately due to the power line project AEP-SWEPCO is attempting to foist through Northwest Arkansas. I keep looking up at the oaks surrounding my home and attempting to fathom power poles over twice their height and with concrete foundations that go 30-40 feet into our karst terrain. The clear cut right of way, as wide as a 12 lane highway and kept dead of natural forest growth in perpetuity through the application of toxic cocktails of noxious herbicides is enough to make me sick. It offends the sensibilities of one who loves wood. Now the Dutch word for fist is vuist. You didn't know I could talk about the Wisdom of the Hands and proposed destruction by AEP-SWEPCO so fluidly in the same paragraph? Today in the wood shop, I continue making parts for small boxes. 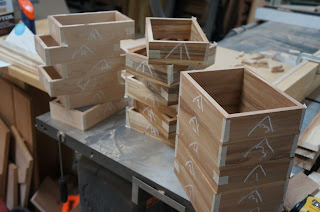 The plan is that once I have a supply of parts cut, I can assemble boxes as needed to fill orders as they come it... Thereby keeping my time for writing less constrained. I continue to work on the writing of chapters 5 and 6. There is a difference between the vuist, and the open, creative hand. The fist is of little more use than a hammer that registers pain from its impact on harder things. To use the fist is to threaten force or to get what you want by misrepresentation, intimidation and fear. In legal parlance, it could be referred to as eminent domain. There are better things by far than to have things foisted upon us. But that seems to be the role of AEP-SWEPCO, and a number of other American corporations. Rousseau had advised that a young man put in a woodshop would benefit from the collaborations of brain and hand thus becoming a philosopher as well as a craftsman. On the SWEPCO front, some of us had been wondering where an important letter could be found in which the US Army Corp of Engineers informed the power company SWEPCO, that three of their proposed routes were being summarily rejected from consideration. We knew that since the letter was not being made readily available to us, there must be other important things in it. Yesterday we found it hidden in plain sight, mulched in with a number of other letters on the Arkansas Public Service Commission website so few would notice its existence, and most certainly all would presume its unimportance. It has been difficult for me to consider the burying of this letter as anything but a deliberate act. I could be inclined to take that as a sign of collusion between the applicant and the state commission that is supposed to regulate it. I hope my inclination to assume collusion is in error. I've written the judge, the APSC lawyer and chief of staff to ask that the letter be more prominently posted and given the proper consideration it deserves. The Corp of Engineers letter informs the utility company and the Arkansas Public Service Commission that the Environmental Impact Statement for the project is lacking in sufficient quality to allow any of the proposed routes to be used without further, more extensive study. In other words, if the Public Service Commission takes its job seriously, the project could and should be summarily dismissed. That would be a tremendous relief. Meanwhile back in the wood shop. 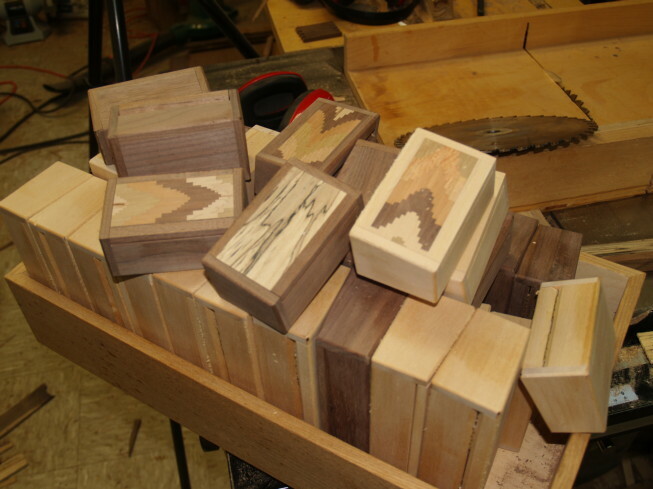 I've cut and planed strips of hardwood from which my usual production run of small boxes will be made. I am currently cutting small parts, each of which will receive a variety of milling operations in order that they will fit each other. I've done all this so many times. And yet it cannot be mindless. I must carefully examine each piece as its cut, so that any flaws in the material can be discarded without unnecessary waste. In a way craftsmanship is akin to prayer. It pulls the thoughts into the here and now... into the essential moment in which we exercise the greatest power. Working against a utility company is no piece of cake. They have powerful legal teams. They have the advantage of regular if not cozy relationships with governmental regulators. They have unlimited resources. They have the advantage of catching folks like us by surprise and at a complete disadvantage. And on the other hand, I've never before seen what I see in SWEPCO's application. 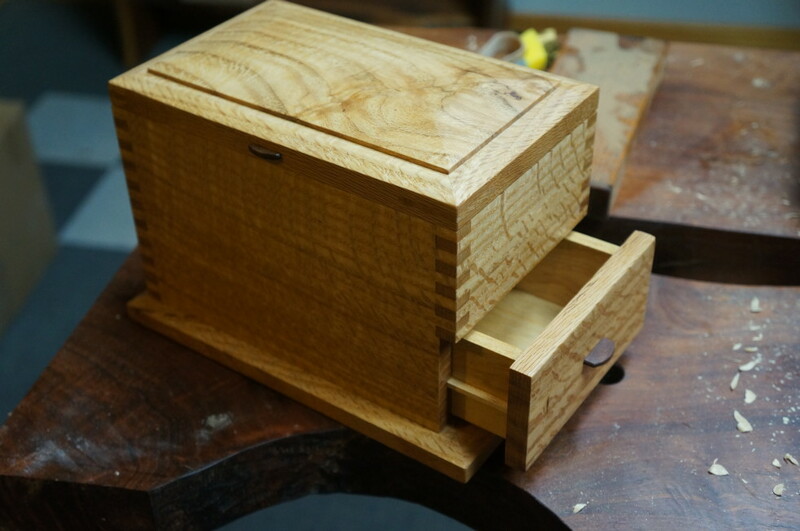 In my wood shop, I can screw up, acknowledge my mistakes and make an effort to fix things... That's not what we're likely to see from American corporations. There is a Chinese saying that applies to this... If you perceive evil, rather than confront it directly, thus becoming ensnared by it and immobilized by it, simply proceed to do the good. There is no doubt that in the wood shop, we are empowered to do good things, and in that, refreshment of spirit can be found. Another Rousseau quote to paraphrase in conclusion... when the hands and mind are equally engaged in learning, each refreshes the other. Sometimes the sidelong effort can lead to better results, and time in the wood shop is never a waste.